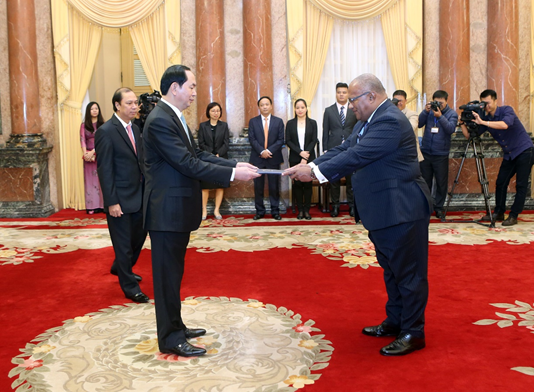 In a solemn and historic ceremony held on 9 November 2016, in the city of Hanoi, Vietnam, HE Isikeli Mataitoga presented the Letter of Credence, his official appointment as Ambassador Extraordinary & Plenipotentiary of Fiji, to HE Mr. Tran Dai Quang, President of the Socialist Republic of Vietnam. This is the first time an Ambassador has been appointed for Fiji to Vietnam since diplomatic relations was established in 1993. Ambassador Isikeli Mataitoga presenting Credentials to HE Mr. Tran Dai Quang, President of the Socialist Republic of Vietnam. In accepting the letter of credence from Ambassador Mataitoga, HE Mr. Tran Dai Quang expressed the desire of the Vietnamese Government that bilateral relations between the two countries will deepen during his tenure. HE President Quang voiced his hope that the two countries will further engaged at high level political exchanges, as well as senior government officials level, to promote better understanding of each country’s development priorities and boost greater awareness. The President urged that Fiji and Vietnam look at ways to promote trade and economic relations between them and encourage the role that the private sector plays. Mr. Quang also urged Ambassador Mataitoga to visit and engage with industry and business representatives in Ho Chi Ming City, the commerce capital of Vietnam. President Quang further observed the need to discuss ways of cooperative support between the two countries, particularly in the United Nations, as well as other international forums, on critical common issues. In his response, Ambassador Mataitoga thanked President Quang for accepting his Credentials as Ambassador to Vietnam; formally opening the way for the two countries to develop and diplomatic ways to improve their relations in all spheres of government. 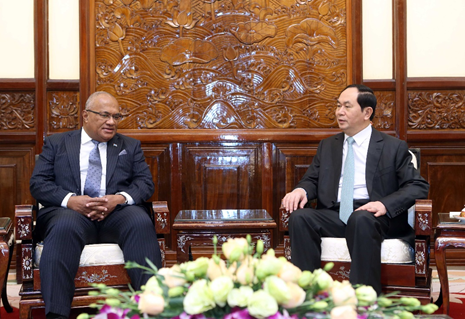 HE Mataitoga informed that he is keen to pursue and deepen bilateral relations between Fiji and Vietnam in all areas referred to by the President. 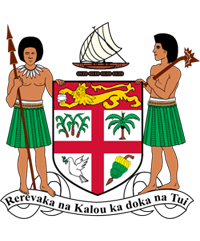 He observed that Fiji is keen to explore innovative ways, on boosting trade and investment relations between the two countries and underscored the role of the private sector in this regard. The Nippon Foundation and Government of Japan, in collaboration with The Nature Conservancy hosted an International Symposium on Capacity Building for Sustainable Oceans from 19th July to 20th July 2016, at The Capitol Hotel Tokyu in Tokyo, Japan. The symposimum was attended to by Heads of Government, science, industry, academia, international organizations and community representatives. The two-day symposium is in pursuit of the commitment made by The Nippon Foundation at the Rio+20, to open a global dialogue to support many communities and countries to improve ocean health. The Foundation together with the Government of Japan and The Nature Conservancy then created a platform to explore innovative Global ocean building practices on the managing of our oceans and educating and connecting. Profile of practical examples of successful programs at the community level, as well as cross-boundary networks to discover the available opportunities for taking care of our oceans were also noted. The two-day symposium also explored elements of each practice which are specifically effective at building capacity in relation to issues such as ocean education, fisheries, marine and coastal planning, climate change adaptation, science for decision making and multi-stakeholder networks. It also provided a special panel discussion on the Future Prospect for Ocean Education in Japan, stressing on the need to create more awareness of the ocean’s essential services and contributions, to which one mentioned of the need to increase applicants for jobs on the sea. H.E Tommy Remengesau Jr., President, Republic of Palau and H.E. Anote Tong, Former President of the Republic of Kiribati also gave keynote speeches at the Symposium Opening. Ambassador Mataitoga and Second Secretary Kelera Savu attended from the Embassy. 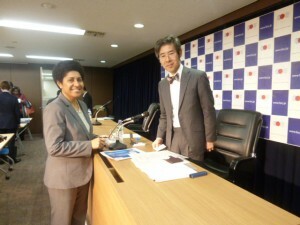 On 10th February 2015, Japan’s new Development Cooperation Charter was approved by the Cabinet. On the same day, a presentation on the approved Charter was convened at the Nippon Press Building by Mr. Ken Okaniwa, Deputy Director-General of the International Cooperation Bureau and Deputy Press Secretary of the Ministry of Foreign Affairs, to explain about the new Charter. The briefing was attended by journalists from Germany, Singapore and the United States and 32 Diplomatic Mission representatives in Tokyo. Counsellor Julia Korovou and Second Secretary Ms. Kelera Savu attended on behalf of the Embassy.